Farewell, Dear People: Biographies of Australia’s Lost Generation retrieves the lives of ten Australians of outstanding potential who exemplify their nation’s lost generation of World War I. Featuring prodigious research and acclaimed writing, the extended biographies bring to life these special but long forgotten Australians for the first time. 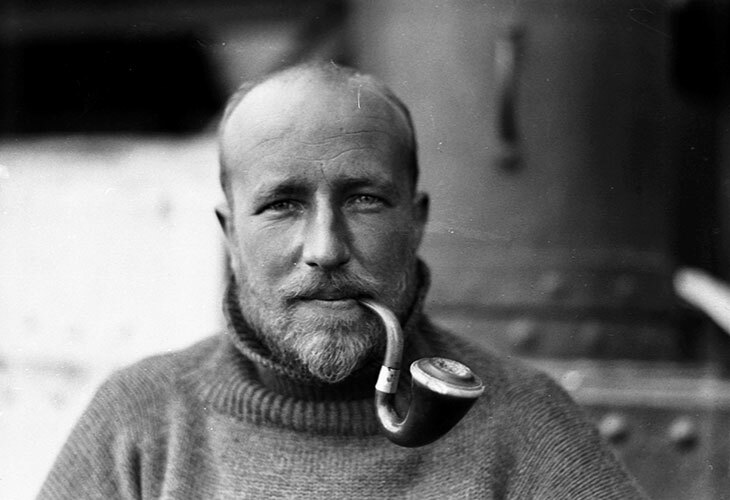 They include an internationally renowned medical scientist, an Antarctic explorer, a Rhodes scholar, a barrister, a winemaker, a footballer, a rising Labor star and a popular farmer who inspired the film “Gallipoli”. 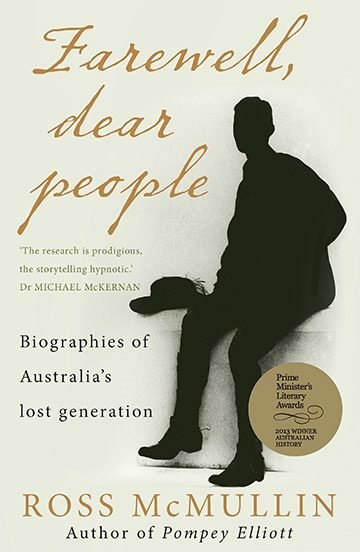 Farewell, Dear People was awarded the Prime Minister’s Prize for Australian History and also the National Cultural Award. Ross McMullin has taken 10 young men from different backgrounds and various parts of the country who were killed in the Great War and poignantly recounts the story of their relatively short lives. Amongst these lost leaders were sportsmen, lawyers, a scientist, a politician, a farmer and a winemaker. The book, drawing on first hand sources, provides a fascinating glimpse into the Australia of the late 19th Century and then the first decade before the conflict that engulfed Europe and drew in the British dominions. It also tells the reader a great deal about how the war was actually fought on the ground by those present on the Western Front and at Gallipoli. Particularly moving are the accounts of how the families of these young men responded to their deaths. Many of them never fully recovered, and the memory of this lost generation was an ever-present shadow over Australia in the 1920s and 1930s. This is a powerful and important contribution to Australian history. There is so much to admire and to praise in this book. The research is prodigious, the storytelling hypnotic, the confidence and clarity of the writer remarkable. This is a rich book, to be sure. One that I read with such pleasure and admiration. It is a wonderful tribute to the 10 men whose lives we discover for the first time, an extraordinary account of Australia from about the 1870s and into the 1930s, and deeply moving. Ross McMullin makes a powerful case: Australia lost grievously in losing these men and we forget them to our great loss. It is a gripping read and a remarkable achievement. I, for one, had difficulty putting it down. The author, true to previous form, writes with a flair and elegance that complements the fascinating [biographies]. The tenderness with which McMullin constructs his 10 ‘stories’ indicates a clear connection at a personal, as well as at a professional, level with his subject matter. 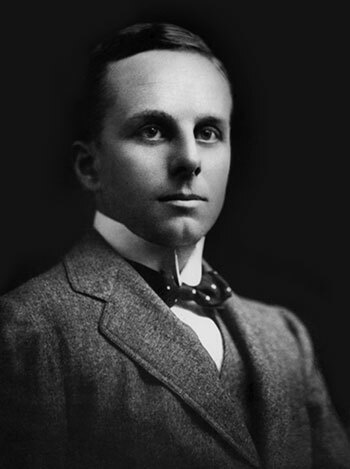 Aside from the innately captivating stories of the lives under investigation within the book, McMullin’s most significant achievement is the conveyance of the breadth and depth of personal and community trauma associated with the deaths of his ten exemplars of lost Australian youth … The anguish, tragedy, and magnitude of loss resulting from the First World War are no surprise for me; yet this book, and these stories, still touched me. Another outstanding aspect of Farewell, Dear People is the depth and breadth of archival and secondary research conducted by the author … This is a powerful and valuable book — a welcome addition into my library and one I enthusiastically recommend into yours. Farewell, Dear People is a powerful revelation of the lasting cost of the Great War — a deeply felt engagement with lost lives, and a superb union of research and writing. A remarkable achievement. These biographies of Australia’s lost generation fill an immense gap. [They] allow us to glimpse the enormous creative potential in that vast reservoir of humanity, and to realise just how much our society lost in that terrible war … Ross McMullin reminds us that amongst the legions of the lost there were so many gentle, urbane, complex, sophisticated young men … [His] achievement is not just the scope of his work, but the way he fills in the spaces and silences that so often bedevil biographers … You’ll admire the way he can sketch a character, paint a picture, evoke a personality … His prodigious, meticulous and painstaking research [has unearthed] letters that are arresting in their intimacy. I can appreciate why it has made such an impact in Australia. It is original in conception, well-researched, beautifully written and illustrated — and altogether a very moving account of a piece of social history. Ross McMullin is a first-class historian, having won deserved acclaim for his centenary history of the Australian Labor Party, The Light on the Hill, and a thoughtful, enlightening account of Chris Watson’s first national Labour government, So Monstrous a Travesty. His earlier military biography, Pompey Elliott, is justly regarded as a convincing assessment and clear portrait of one of Australia’s best and most revered military commanders of the Great War. C.E.W. Bean, our foremost historian of the Great War, [believed] that the sacrifices of the lost generation should inspire Australians to do great things in the peace. McMullin’s heroes would all have been mighty contributors to the Australian post-war future, had they lived. 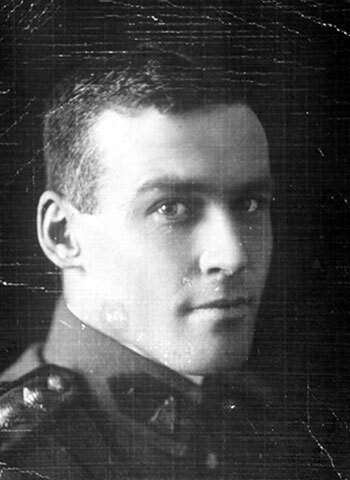 Ross McMullin would once have been placed in the Charles Bean tradition of military history. Now, McMullin is the Bean tradition. This is a remarkably good book, with its tapestry of battle, its chronicle of wasted talents and its evocative descriptions of the impact of loss upon Australian families, especially on women. Farewell, Dear People has elevated the study of Australia’s involvement in the Great War to a new dimension. It is a remarkable tour-de-force in terms of research because of the way it links the battlefield to the home front. Historians have often ignored that connection, reflecting the division between ‘war history’ and traditional military history, but McMullin makes it work through the use of case studies. He deftly creates a picture of his subjects within their family and social contexts, what they were like, what they may have thought life held in store for them, the reasons for going to war, their deaths and the impact of the news of their deaths at home. In fact, in some examples, the impact at home receives greater attention than the life of the men at the front. Elliott’s story, for example, is a good (or sad) example of that, particularly when it comes to the story of the descent into insanity of a mother with four boys at the front, a husband in England as a war worker, and a delinquent son. At long last we have a book which seriously examines the fearful cost to Australian society as a result of the Great War of 1914–1918 … McMullin has set a new standard in Australian military biography, for which he must be congratulated. Very highly recommended. A fascinating look at Australia at the turn of the 20th century, as well as a meditation on what might have been. Farewell, Dear People is a tribute to a group of exceptional Australian men who were not just a loss to their families but to the entire nation — and, at least in one case, the world … The award-winning author of Pompey Elliott revisits the men’s lives in vivid and careful detail. It is the depth of the telling that heightens their loss.